Using Office 365 to offer a more flexible, mobile and user-friendly way of working across the organisation. SEAI’s datacentre was on premise, resource intensive and capital investment heavy. With the Microsoft Office 365 cloud platform solution, SEAI were able to resolve issues around growth demand and legacy technology/cycle refresh. Providing flexibility and scalability around ICT services was also key. The project aligned with SEAI’s green ethos, because public cloud datacentres operated by companies such as Microsoft are often more energy efficient than private server facilities run by individual organizations, including the datacentres SEAI was using. The Sustainable Energy Authority of Ireland was established as Ireland’s national energy authority under the Sustainable Energy Act 2002. SEAI’s mission is to play a leading role in transforming Ireland into a society based on sustainable energy structures, technologies and practices. However, regarding SEAI’s own IT business infrastructure, a lack of integrated technologies and out-of-date software was impeding true collaboration across the company. There was also an impact on their ability to provide flexible and modern work practices for their inhouse and mobile work forces. Furthermore, there was a need to move away from the traditional Capex spend model to an Opex based spend model.unnecessary on premise datacenters requiring servicing were costing money that could be channeled to other business purposes. Microsoft Office 365 (Office 365) includes a number of integrated applications that work from a cloud platform that could replace and, ultimately, decommission some of SEAI’s on premise server and storage centers. But that is not the only reason we suggested Office 365. We have worked with SEAI for some time and are aware of exactly what they demand from their IT infrastructure, so we knew what this cloud solution could provide and that it would satisfy SEAI’s requirements. This strategy tied directly into SEAI’s own strategy of outsourcing standard IT systems and functions to a Cloud and Opex model, where possible and practical. Office 365 would give them access to a workplace social network with Yammer, Video Sharing and Share Point sites. Users would be able to instant message and hold online meetings with Skype for Business. SEAI users would get access to OneDrive for Business with very healthy storage limits. Users could edit their documents with Office Online, the browser version of Microsoft Office and, finally, users could take advantage of the document management functions, such as archiving, rights management, data loss prevention, and document-level encryption, which are available to increase data security when users are collaborating. To ensure this change in how IT is provided to SEAI users Unity also included some adoption services where our certified Microsoft trainer provided classroom sessions for SEAI users during go-live week. – The replacing of local file storage in the Cloud eliminated the need to spend on increasing such storage. This allowed SEAI to grow and onboard new staff into a familiar digital workplace. – Some software was discovered to be out of date on our initial analysis, but this will not happen in the Office 365 package because everything updates automatically from the cloud, giving users the best experience possible. – Greatly reduced licensing costs. – The integration across Office 365 means workflows are integrated, allowing for effective collaboration, ease of decision making and increased speed of communication throughout the company. – Information stored on Office 365 is protected and encrypted and because this comes as standard with the product, costs for such high-level IT security is reduced when compared to purchasing similar security solutions individually. Office 365 packages are designed to be flexible, and we initially suggested SEAI should deploy the license type of Office365 E3. However, in time we believe it would be beneficial for SEAI to avail of the E5 plan, which includes increased IT security, decommissioning of on premise phone system hardware and access to in-depth business analytics via PowerBI, collected from all the integrated Office 365 and third party applications. SEAI are also considering Enterprise knowledge management and Adaptive Defence. From a business perspective, the implementation of this solution was a seamless process and there was no disruption to front-line staff. 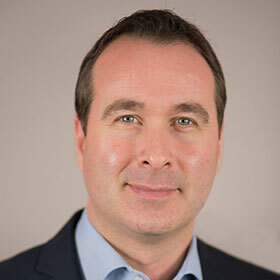 Simon joined Unity in January 2012 and has more than 20 years’ experience driving sales and organisational growth.